Sea Island Company CEO Bill Jones III is helping bring the world to Georgia's door. For coastal historians, it is easy to believe the arrival of the G-8 summit later this year is a natural part of a manifest destiny. When the leaders of Canada, France, Germany, Italy, Japan, Russia, the United Kingdom and the United States come together for their discussions on Sea Island in June, they will continue a tradition begun 300 years ago when successive Scottish, English, Irish, Norse, Welsh, French and Spanish seafarers landed there for provisions, or stayed to build settlements. Once again, the island will renew its connections to the rest of the world. No one on the coast better understands the interplay of the region’s history and its promise better than Alfred W. “Bill” Jones III, regarded as the most important figure in bringing the three-day meeting of seven foreign heads of state and President George W. Bush to Georgia. For his role in securing the G-8 summit for the state, Bill Jones III is Georgia Trend’s Georgian of the Year for 2004. The G-8 summit will provide the state an unmatched opportunity to make history in economic development and promote stronger international relationships. In addition to heads of state, another 7,000 staffers, diplomats, trade representatives and journalists will descend on Georgia’s coast. Their arrival will see the kind of beach landing unique to the Golden Isles – an invasion whose reconnaissance platoons are already ashore. It was Howard Coffin who envisioned the Cloister and then enlisted the help of his young cousin, Alfred William Jones Sr., Bill’s grandfather, to make it a reality. The resort opened in October 1928 and quickly became a favorite refuge of wealthy industrialists, high government officials and celebrities, who prized it for its luxury and its privacy. It is likely that old connections may have combined with history to give Sea Island an edge in securing the summit. Hosting privileges for the G-8 rotate among member nations; the final authority on selecting the 2004 location was President Bush, whose parents honeymooned on Sea Island and have returned many times since. The Walker Cup, a prestigious international golf event, was held on Sea Island in 2001 and attended by former President Bush. The event is named for his grandfather, George Herbert Walker. Was the Sea Island location a foregone conclusion? “No,” says Jones. “It all began when I was talking with two close friends of mine from Washington who are involved in the administration and were here last fall. I asked if there might be a good opportunity to do anything that might showcase Sea Island. G-8 was mentioned and they asked if that was something that might be of interest and I said, ‘Absolutely.’ We were notified in early 2003 that we were on the list.” But when the government’s site-selection committee members visited the island, they expressed concern that the island’s signature hotel, the Cloister, would be under reconstruction during the summer. The host can also rely on geography to keep protesters from disrupting the meetings. Sea Island is accessible only by bridge, boat or air, a part of its charm for the rich and famous who frequent it. “We are fairly remote, easy to secure, we have hosted world leaders and put on world-class events,” says Jones. “We have the assets and the experience to do the job.” The job will bring world interest and financial rewards to Sea Island and coastal Georgia, but that is only part of the picture. After graduating from Valdosta State University with a degree in education, Jones worked in a number of jobs, including the laundry room at the Cloister, and assumed a succession of leadership roles in the Sea Island Company, beginning as president in 1993. He became CEO in 1995 and was named board chairman in 1997, the two posts he currently holds. Jones and his wife Sally live on the island. Jones is a relaxed, casual and decidedly informal man who wants everyone to call him Bill. In more ways than one, Jones seems the right man at the right time to lead a company that prides itself on casual elegance. A decade ago, when Jones took over, the Sea Island Company’s crown jewel was the Cloister, a long-time playground for America’s business nobility, but an aging beauty badly in need of a new roof, plumbing and wiring. Under his reign, the Sea Island Company purchased 40,000 acres of woodlands and marshes along the Atlantic, a tract that features 41 miles of coastal edge. Jones has begun a $350 million master development plan centered on construction of a new and improved Cloister. Another development, Frederica Township, is an $800-million project on 3,500 acres at the north end of St. Simons Island. Jones also presided over the construction of the Lodge, a 41-room resort, and the Ocean Forest Golf Club. Along the way, the Sea Island Company has become the largest private employer on the Georgia coast, with 1,700 people on the payroll. Jones glosses over his role in his company’s successful growth. “All I’ve done is take Howard Coffin’s 1928 vision and reinterpreted it,” he says. Gross revenues last year totaled $300 million. 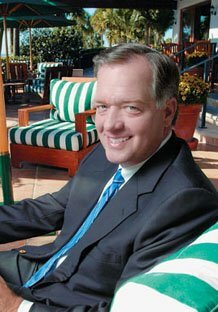 Last October, Bill Jones stood in the solarium of the Cloister before a group of economic developers from the coastal region and Atlanta who had gathered to hear about the summit. He opened his remarks by sharing the news that the Lodge at the Sea Island Golf Club had just reclaimed its title as a Mobil Five-Star restaurant, one of just four in Georgia. Another bit of serendipity for Jones – a world-class restaurant awaiting the world leaders. With quiet confidence, Jones told his luncheon mates, “The summit will be a success.” He offered a slight smile and raised both eyebrows. He was clearly excited.